Is it better to acknowledge an unpalatable truth or to embrace the comfort of myth? 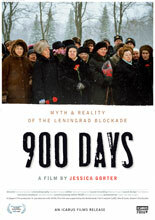 Jessica Gorter's 900 DAYS contrasts the devastating and unforgettable stories recounted by survivors of the Siege of Leningrad, the infamous German blockade, which caused the deaths of more than 1 million people during World War II, with the triumphant memorials fabricated by the Russian state. The blockade, one of the most incredible, defining events of World War II, remains largely unremembered outside of Russia. In September 1941, the 3 million inhabitants of the city now known as St. Petersburg were trapped without food or drinking water. For 900 days of subzero temperatures, people had to eat glue, leather soles, cats, and perhaps even their fellow human beings. When the city finally opened up again, nearly a million had died. Immediately after the war, investigations of the blockade were forbidden. The Soviet propaganda machine transformed the survivors into a symbol of national heroism, silencing any questions about Stalin's war policy and its toll on the lives of ordinary Russians. In 900 DAYS, Gorter employs newly declassified material from the Secret Service archives that reveals, in coldly impersonal statistics, the extent of cannibalism in the blockaded city and the population's fury with their own authorities. Footage of present-day Russian memorials to the survivors of the siege illustrate the persistence of the official, heroic account of the event even in light of this new information. Elsewhere in the film, survivors speak openly, many for the first time in their lives, about their experiences and the post-war censorship. Their painful memories overshadow the public myth in which some of them had previously participated. All their lives they have been told they were heroes who guided the country toward victory, but they are increasingly aware that true recognition of their traumatic experience and the ruinous policies that allowed it to continue is still, even after half a century, far away. The world's largest museum devoted to Lenin offers a "true Soviet-era experience." But can it survive in the new Russia? The noted historian's lifelong quest to describe the extermination of the European Jews.